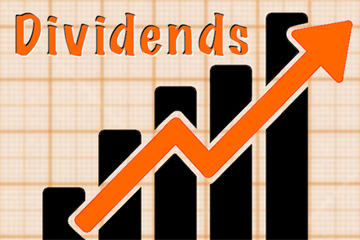 Dividend increases continue to roll in for dividend growth stocks in the CCC list! Part 1 covers dividend increases announced for stocks in the Communication Services and Consumer Discretionary sectors. Part 2 will cover the Real Estate and Utilities sectors, while Part 3 will cover the remaining sectors. I monitor dividend increases for stocks on my watch list of dividend growth stocks to identify candidates for further analysis. Companies that regularly increase their dividends show confidence in future earnings growth potential. This past week, 27 companies that announced dividend increases passed these screens. The table below presents a summary of increases announced for stocks in the Communication Services and Consumer Discretionary sectors. Please see Part 2 and Part 3 of this article for coverage of dividend increases in other sectors. Founded in 1993 and based in Louisville, Kentucky, TXRH is a restaurant chain operating in the United States and internationally. The company operates and franchises restaurants under the Texas Roadhouse and Bubba’s 33 brand names. TXRH offers specially seasoned and aged steaks hand-cut daily and cooked to order over open gas-fired grills. The board of directors of TXRH has declared a quarterly dividend of 30¢ per share. The new dividend is 20.00% above the prior dividend of 25¢ per share. The dividend is payable on March 29 to shareholders of record on March 13. Formerly known as Textiles Gildan, GIL is a manufacturer and marketer of branded basic family apparel, including T-shirts, fleece, sports shirts, underwear, socks, hosiery, and shapewear. It operates in two segments, Printwear and Branded Apparel. GIL was incorporated in 1984 and is headquartered in Montreal, Canada. GIL will pay a quarterly dividend of 13.4¢ per share, an increase of 19.64% over the previous quarterly dividend. The quarterly dividend will be paid on April 1 to shareholders of record on March 7. The ex-dividend date is March 6. MGA is an automotive supplier with manufacturing operations and product development, engineering, and sales centers in more than 30 countries. The company’s product capabilities include producing body, chassis, interior, exterior, seating, powertrain, electronic, vision, closure, and roof systems and modules. MGA was founded in 1957 and is headquartered in Aurora, Canada. On February 22, the company declared a dividend of 36.5¢ per share. The new dividend represents a 10.61% increase. The dividend is payable on March 22 to shareholders of record on March 8. Founded in 1879 and headquartered in New York, New York, FL is a retailer of athletic shoes and apparel. The company’s Athletic Stores segment sells athletic footwear, apparel, accessories, and equipment. The company's Direct-to-Customers segment includes Footlocker.com and other affiliates, as well as its international e-commerce businesses. On February 20, the company declared a dividend of 38¢ per share. The new dividend represents a 10.14% increase. The first payment will be on May 3 to shareholders of record on April 18. The ex-dividend date is April 17. MCS, together with its subsidiaries, owns and operates movie theatres, hotels, and resorts. The company operates movie theatres in Wisconsin, Illinois, Iowa, Minnesota, Missouri, Nebraska, North Dakota, and Ohio. Also, it owns and manages hotels, resorts, and other properties nine states. MCS was founded in 1935 and is headquartered in Milwaukee, Wisconsin. The company's board of directors approved an increase in the quarterly dividend of 6.67% to 16¢ per share. The dividend is payable on March 15 to shareholders of record on March 4. Founded in 1928 and headquartered in Atlanta, Georgia, GPC distributes automotive and industrial replacement parts, office products, and electrical and electronic materials. The company’s segments include Automotive, Industrial, Office Products Group, Electrical/Electronic Materials and Other. GPC has operations in the United States, Puerto Rico, the Dominican Republic, Canada, Mexico, Australia, and New Zealand. The board of directors of GPC has declared a quarterly dividend of 76.25¢ per share. The new dividend is 5.90% above the prior dividend of 72¢ per share. The stock will trade ex-dividend on March 7, and shareholders can expect to receive the new dividend on April 1. SCI provides deathcare products and services in the United States and Canada. The company provides funeral and cemetery operations comprising of funeral service locations, cemeteries, crematoria, and related businesses. The company also provides professional services relating to funerals and cremations. SCI was founded in 1962 and is headquartered in Houston, Texas. The company increased its quarterly dividend by 5.88%, from 17¢ per share to 18¢ per share. The ex-dividend date is March 14 and the dividend will be paid on March 29 to shareholders of record on March 15. Founded in 1999 and headquartered in Washington, D.C., CCOI provides high-speed Internet access and Internet protocol communications services to small and medium-sized businesses, communications service providers, and other bandwidth-intensive organizations in North America, Europe, and Asia. CCOI offers bandwidths up to 100 Gigabits per second. The company announced an increase of its quarterly dividend of 3.57% to 58¢ per share. CCOI will trade ex-dividend on March 7. The dividend is payable on March 29, to shareholders of record on March 8. Founded in 1968 and headquartered in Chicago, Illinois, TDS is a diversified telecommunications company that provides wireless, wireline, cable, and hosted and managed services in the United States. TDS also provides a range of information technology services, including colocation, cloud computing, hosted application management, and sales of information technology hardware and related professional services. The company announced a quarterly DIV increase of 3.13% to 16.5¢ per share. All shareholders of record on March 15 will receive the new dividend on March 29. Please note that I'm not recommending any of these stocks. Readers should do their own research on these companies before buying shares. Below, I'm including charts from F.A.S.T. Graphs for three of this week's dividend raisers, TXRH, FL, and SCI. 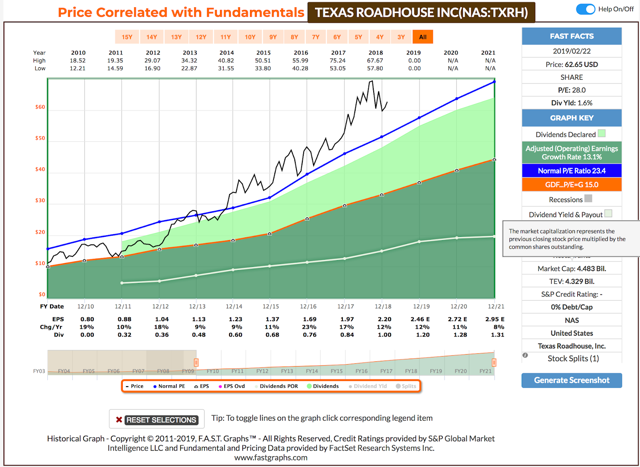 TXRH's price line (black) is above the primary valuation line (orange) and above the stock's normal P/E ratio (blue). The stock is trading at a premium to fair value. An investment in TXRH in January 2010 would have returned 21.7% on an annualized basis (with dividends included). 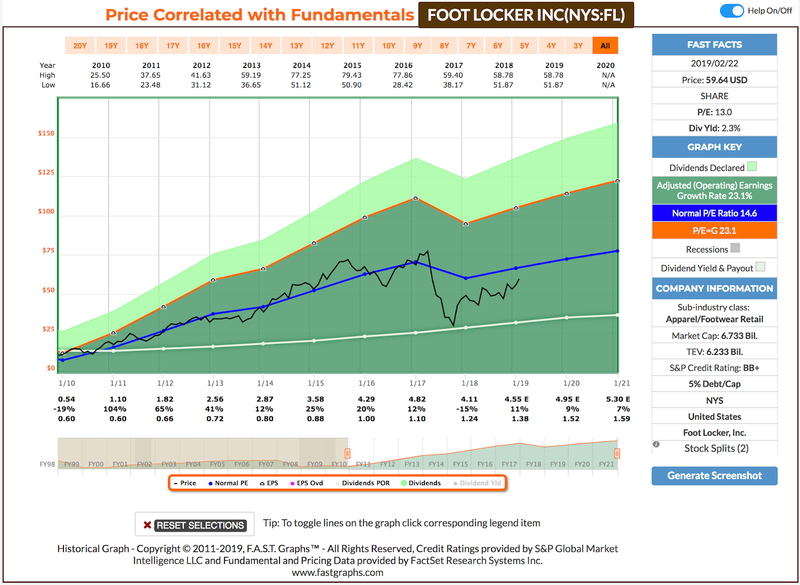 FL's price line is below the stock's normal P/E ratio and below the primary valuation line. The stock is trading at a discount to fair value. An investment in FL in January 2010 would have returned 21.7% on an annualized basis (with dividends included). SCI's price line is above the primary valuation line and above the stock's normal P/E ratio. The stock is trading at a premium to fair value. An investment in SCI in January 2010 would have returned 20.8% on an annualized basis (with dividends included). The table is sorted by Ticker, and as before, Next Div is annualized. Please note that the table contains ex-dividend dates of stocks in the Communication Services and Consumer Discretionary sectors only. Please see Part 1 and Part 2 for ex-dividend dates of stocks in the other sectors.